A while back I posted a newspaper clipping from the Nashville Union and American July 3, 1872 edition mentioning that the African Americans in Ripley had gotten together to form a Union League/Benevolent Society. You can find the original article here -> Newspaper Clippings – Nashville Union and American July 3, 1872. While browsing through Sanborn Maps I noticed that one of the maps depicted a location known as the “Colored Lodge”. Could it have also been known as the Benevolent Society? Its location would have been right across the street from the First Baptist Church on Main Street next door to the present day location of Pitts Barbershop. I noticed that the Colored Lodge seems to be on the second story of this building with an undertaker on the first story. I’m curious to know who this undertaker might have been. Could this undertaker have catered to African Americans? The Hudson and Graham Funeral Home was not established until 1910 and Alex Clay of the Clay Funeral Home would have been a young child at this time. 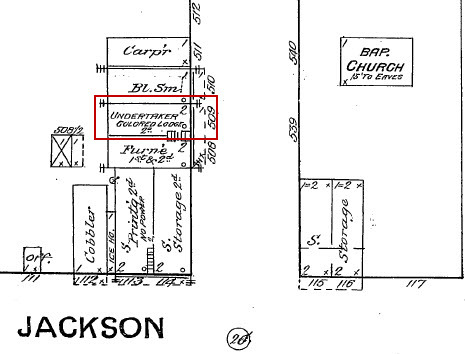 By the 1891 Sanborn Map the heading for this location was no longer noted as “Colored Lodge”. The second story of this building was a furniture repair shop and the first story of this building was still occupied by an undertaker. Tiffany, where did you find the Sanborn maps? I would love to see what they contain about my house. Thanks. Thanks for commenting. Sometimes you can find them online or in your local library. Send an email to Tiffany@blackripley.com with what your looking for and I’ll send you what I find.